What could be more comforting during the holidays than a traditional Christmas dinner shared with family and close friends? While food blogs at this time of year often offer us "new and creative" Christmas recipes, sometimes we just crave the classic, tried-and-true Christmas recipes that we grew up with. That's what we've collected here for you in our holiday round-up of the best traditional Christmas recipes for appetizers, main courses, side dishes, and desserts. Just pick and choose among these menu options and enjoy a classic holiday dinner this year. 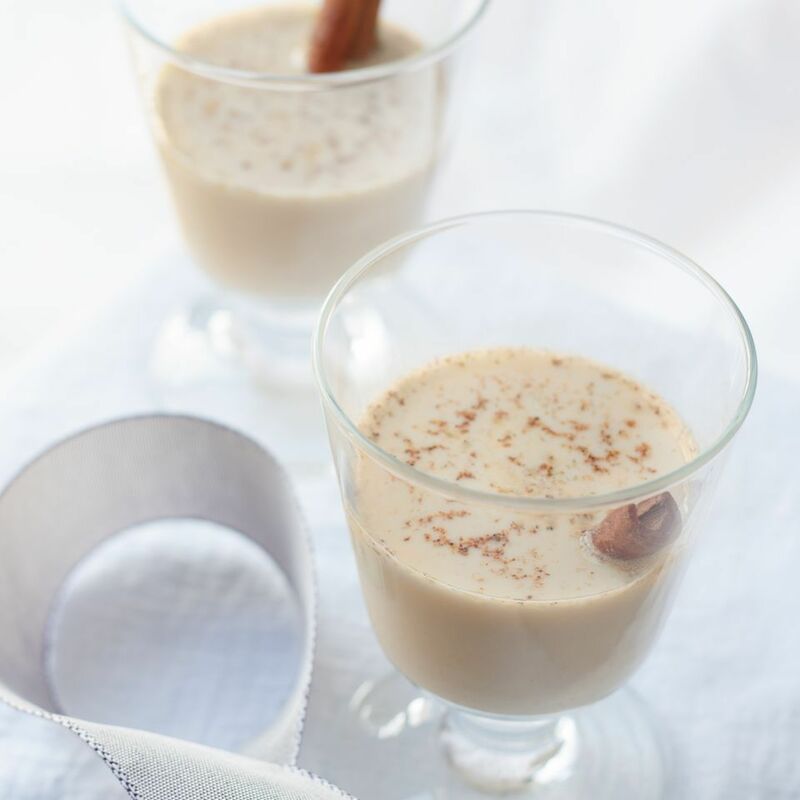 Eggnog is a Christmas holiday essential. The sweet, traditional taste of toffee is the perfect way to dress up the drink this holiday season. You can serve this recipe with or without alcohol. Try garnishing it with crushed toffee candy or broken Skor bars, for an extra-special holiday treat. These cranberry meatballs make a fabulous appetizer at traditional Christmas dinner parties. The berry flavor in the sauce mixture adds a tangy, fruity lift that makes these meatballs extra festive. Serve on a platter with toothpicks to serve them as a starter or plate them as a first course at the table for a more elegant presentation. Stuffed mushrooms are a delicious, savory appetizer that are ideal for holiday gatherings. The mushrooms are first soaked in Marsala wine before they're stuffed with savory sausage, salty Pecorino cheese, and crunchy seasoned breadcrumbs. You can easily multiply the recipe to serve a big crowd. Christmas and cranberries go together like Santa and presents. Here's a decadent holiday appetizer that would make an ideal starter or appetizer at Christmas dinner. Creamy, soft Camembert cheese is cut into wedges, dredged in seasoned flour, and fried until crunchy-on-the-outside and gooey-on-the-inside. Serve it with cranberry sauce dip for a flavorful bite that's like Christmas in your mouth. Dine on the same meal that Scrooge and the Cratchit family enjoyed in the Charles Dickens classic "A Christmas Carol." 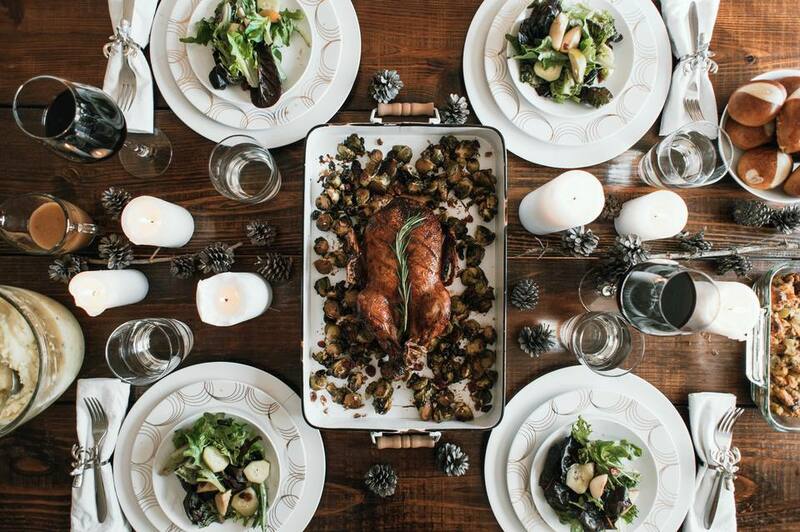 Bring a wonderful old-fashioned Christmas tradition to life when you serve a whole roasted goose. This modern take on a Victorian recipe has you brining the bird overnight to ensure flavorful and moist meat. Filling the cavity with fruit gives the roasted goose an incredible flavor and scent and makes your kitchen smell divine. For your Christmas dinner, this mouthwatering recipe for honey glazed ham is simply spectacular. Baked ham is a holiday favorite that's great for slicing and serving to a crowd. Here, the meat is coated with a rich and thick caramelized glaze, spiced with cardamom, cloves, and pepper. The scent of turkey roasting in the oven is a lovely and traditional way to welcome guests into your home. In this easy-to-follow recipe, the bird is roasted with a mixture of herbs and olive oil under the skin for a Christmas turkey that's moist and flavorful with every bite. Make it an extra-elegant celebration when you serve beef Wellington as your holiday entree. Named for the Duke of Wellington, this gourmet dish is a traditional favorite in England come Christmastime. While you might be intimidated by the thought of making it at home, this tried-and-tested recipe provides everything you need for pulling off this impressive dish. It's an incredible treat for your guests, especially when served alongside Yorkshire pudding. Pheasant is a game bird that's traditionally enjoyed at Christmas time. Fancy to serve, but simple to make, this recipe combines pheasant with white wine, mushrooms, and herbs in the slow cooker, so it cooks while you open presents, mingle with family and friends, and do everything else that's on your Christmas Day agenda. When you want to wow your guests at Christmas dinner, serve this elegant, impressive cut of meat as your main course. Tender, juicy rack of lamb not only looks fabulous on your holiday table, it's easy to make, so you'll earn kudos as a chef without having to try too hard. This rack of lamb features the classic combination of Dijon mustard along with an herb-and-breadcrumb crust. Here's an easy recipe for a traditional roast beef you'll be proud to serve as the main course at your Christmas dinner. Marinating the beef overnight helps to tenderize and flavor the meat. Then, it's put into a roasting pan and cooked long and slow for a mouthwatering result that your friends and family will want seconds of. This classic roast chicken is so simple to make and impressive to serve, that it may just become your go-to for entertaining guests. Prepping the chicken for the oven is as easy as mixing a few spices and using them to coat the bird. Pop the whole chicken into the oven to bake uncovered for an hour while you mingle with holiday guests or prep other dishes. When it's ready, the result is a moist and flavorful chicken that slices easily. Seafood is the traditional Christmas dinner of choice for some families and this baked fish is a great way to celebrate together. Putting a whole trout on the table looks super impressive, but it's incredibly easy to make for even novice chefs; even better, it's ready in an hour, start to finish. Pork loin is a wonderful choice for Christmas dinner because it's lean, moist, flavorful, and won't break the bank when you're serving a crowd. With a heavenly aroma as it cooks, you're sure to earn plenty of compliments when you serve up slices of this entrée. Pork loin roast is stuffed with chopped apples, apricot, garlic, sage, and Parmesan cheese, then grilled to tender perfection. Duck is a specialty meat that's perfect for serving when you want to impress discerning guests. For your Christmas table this year, why not pull out all the stops? This recipe takes time and effort, but the results are definitely worth it. With a crispy skin and amazing flavor due to the garlicky citrus stuffing, your family is sure to "ooh" and "ahh" over this delicious meal. Butternut squash and sage are a flavor combination that goes beautifully with just about every Christmas entrée. This vegan recipe is so easy to whip up, you'll want to make it throughout the year and not just for the holidays. Just toss cubes of squash with olive oil and sage and roast. If you enjoy the taste of cooked onions, you can add them too (tips included in the recipe) for an extra bit of sweetness and flavor. Homemade bread takes any dinner party to the next level. Guests will appreciate the time you took to bake these buttery yeast rolls. They also freeze well, so you can make them ahead of time, then reheat when guests are on their way. Yorkshire pudding is an absolute classic at the English Christmas table and a welcome accompaniment to any holiday meal. Golden and delicious, they're a match made in heaven for roast beef and other holiday meats and taste wonderful with gravy poured on top. Once you've tried this proven recipe once, you'll never buy ready-made varieties ever again. Wild rice and cranberries are traditional ingredients this time of year. This vegan- rice casserole, topped with crunchy walnuts and flavored with orange juice, makes a lovely accompaniment to turkey, chicken, and pork dishes. For many families, it wouldn't be a traditional Christmas dinner without a big bowl of potatoes on the table. This recipe roasts russets to perfection, then takes them over the top with cooked crumbled bacon. If you have vegetarians coming to Christmas dinner, give them a traditional taste of the holiday that the rest of your guests will also love when you serve this savory, salty side dish. In this vegetarian and gluten-free recipe, Brussels sprouts and shallots are oven-roasted with vegetarian bacon, a splash of white wine, and a generous drizzle of olive oil and salt, for a flavor combination that's hard to argue with. This fabulous Christmas stuffing makes a very delicious and rich side dish. It's perfect stuffed into a turkey or baked in a casserole dish to serve alongside roast chicken, pork, or beef. Chestnuts add a beautiful nutty flavor and a wonderful texture to the easy recipe. A traditional Christmas without mince pies is simply unimaginable. Mince pies have been eaten as part of British Christmas celebrations for many centuries and continue to be a favorite holiday dessert for many families. This easy recipe walks you through how to make these flaky little treats filled with rich, sticky, sweet fruits. An English trifle is a dessert that has graced British tables for centuries. In this classic Christmas recipe, sponge cake fingers are soaked in boozy sherry and layered with creamy custard and whipped cream. It's heaven in a bowl. No traditional British Christmas could be complete without a pudding. Made well in advance of Christmas dinner, "resting" this pudding allows its flavors to blend and mature, so it slowly transforms into the must-have Christmas pudding that so many families know and love. Just reheat on Christmas Day, serving it with traditional brandy or rum sauce or English custard. Strudel is always welcome at the Christmas holiday table, and this strudel is a wonderful way to enjoy the traditional German and Austrian dessert. The strudel filling in this recipe has a lovely, warm Christmas feel to it, with mincemeat, warm spices, sharp apple, almonds and marzipan all wrapped in dough and dusted with snow-like powdered sugar. It's basically Christmas in pastry. Sugarplums are a classic holiday treat popularized in poems and the Nutcracker Ballet. You can be the Sugarplum Fairy herself when you serve up a batch of these homemade sweets! Dried plums or prunes are mixed with cinnamon, cloves, nuts, and other fruits, formed into balls and rolled in sugar, for a very special Christmas candy. We won't tell anyone you put them together in just 30 minutes. A White Christmas Dream is a creamy, elegant holiday cocktail that's fantastic for serving after the meal. You may just want to keep this recipe on hand for whenever the occasion calls for a dose of Christmas cheer. This drink is super simple to make with vodka and amaretto liqueur and a little heavy cream to give it a lush, rich texture. What Are Fun Recipes for Christmas Dinner for Two?